Have you ever found yourself standing frozen in terror—with a new client arriving in 15 minutes, a script with a diagnosis you’ve never heard of, and a full-on case of freak out? There are lots of research options out there to help you plan your treatment session and, contrary to what you might expect, much of the information can be easily accessed in just a few clicks! Whether you’re quickly researching a topic moments before a new eval arrives or you’re diving into full journal articles for an in-service or research project, this post will walk you through your options for finding OT research. Google Scholar is your best starting point to get a lay of the land. Not only does it have the coveted allure of being a free research option in a world of pricey, members-only alternatives, it also boasts the largest, widest variety of categorized articles. The major downside of Google Scholar is that many of its listings link to abstracts, rather than full articles. However, I’m honestly surprised by the number of listings on Google Scholar that DO link to full-text articles. Just as a quick overview, here is an example of a search for “‘occupational therapy’ and ‘dizziness’” in Google Scholar. You will see that the search phrase yields 11,000 results. Google searches for your keywords in both the titles and the full text of the articles. This means that if an article on the subject is online (and contains the terms “occupational therapy” and “dizziness,” Google Scholar should find it. Take advantage of the simple, yet robust, search results. Scholar uses the same classic Google interface you’re familiar with, making it easy to use. On the search results page, the type of content Google spits out is identified clearly. This means if it is a book or website, rather than a journal article, you’re not out of luck; the link takes you directly to the original source. This is unique to Google Scholar, and is very helpful! Another fantastic feature is that Google provides you with the proper citation for every one of its documents in a variety of professional formats, including APA and MLA. Set notifications for future publications. Google Scholar allows you to sign up for email alerts for any keyword or key phrase, such as a diagnosis, intervention approach, or author. When new material is published that falls in your chosen category, you will receive an email. This is a great option for staying up-to-date on the most current research surrounding a specific topic, especially a diagnosis or condition that you might often treat. 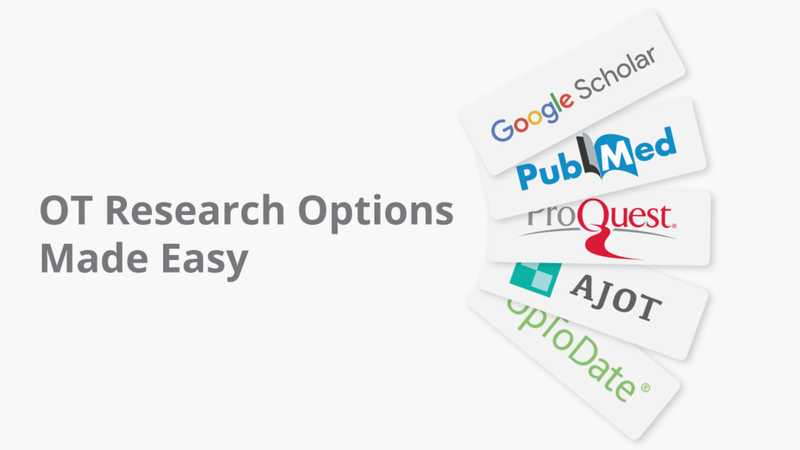 Create your own personalized research library. Google Scholar allows you to create a library, which is your personal collection of articles. You can save articles right off the search page and organize them by topic, plus, you can even perform searches within your library. This seems like an obvious function for a research site to have, but not all of them have this ability. Let’s be honest, if you are frantically trying to learn about a new diagnosis, this is not the place to do it, and there are many reasons why this is the case. Poor quality. Google Scholar is not known for its scrutiny of research; in fact, you’ll notice it has rather low standards for inclusion, including non-peer-reviewed sources and less scientific research methods. This, inevitably, leads to the presence of more “pseudoscience” content in its results. Jumbled output. There is no way to limit results to just articles, or just books. You get everything in one jumble of results. Terminology overload. There’s no strict terminology, so you might see the same journal listed by three different names in the search results. The best thing about PubMed (well, in addition to the fact that it’s free) is that it’s all about high-quality research. PubMed is run by the National Center for Biotechnology Information (NCBI), which is located inside the National Institutes of Health (NIH)—so you know it’s legit. 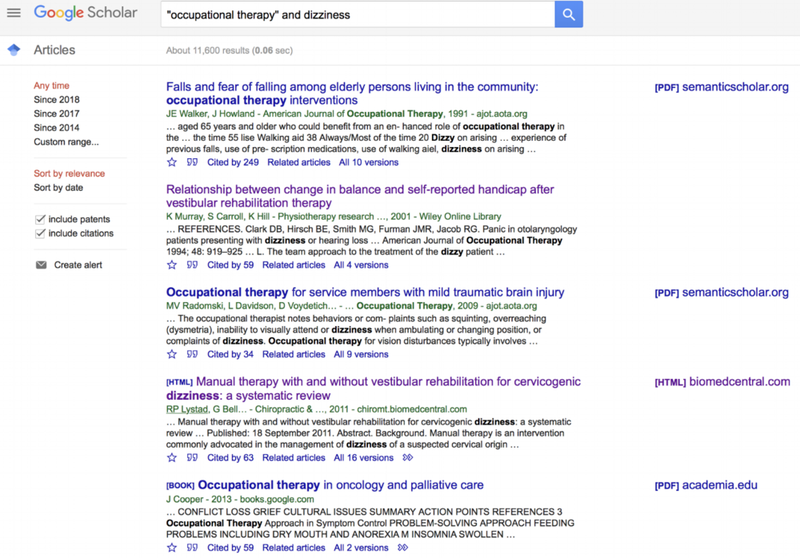 As you can see, the same OT search on dizziness, only yields 30 articles, compared to Google Scholar’s roughly 11,000! Plus, none of the journals comprised by PubMed are specific to occupational therapy—but you can be confident in the evidence-based quality of every article returned in the search results. Search for concepts, as well as keywords and key phrases. PubMed lets you enter a general concept and is smart enough to pull up related results. For example, if you enter “muscle wasting,” PubMed should pull up results on both ALS and MS.
Save citations to your clipboard or library. Take advantage of PubMed Health. PubMed Health is an additional offering that provides info for clinicians and consumers on the treatment and prevention of various diseases and conditions. In true PubMed form, all information is based on solid research, and provides digestible summaries, in addition to full technical reports. Use the abstracts as a starting point. Generally speaking, you’ll be able to tell whether an article will be helpful to you, based on its abstract. If you feel like you need additional access to the full article, you can cross that bridge at that time. Your institution or local medical library must subscribe you for you to have access to many articles. 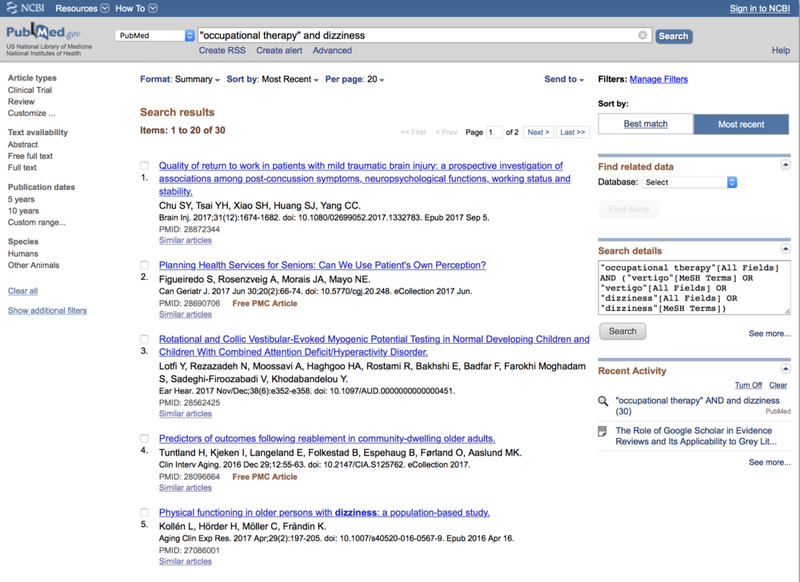 While PubMed is free, search results don’t include the full text of the journal article, instead providing abstracts. Some abstracts displayed in the citations may provide links to the free full text from other sources (for example: directly from a publisher’s web site), but many of the sources (like university libraries) require separate login credentials. No relevance sorting. PubMed doesn’t allow search results to be ranked by relevance; you can only sort by date. Limited results. You won’t get nearly as many results as you would on Google Scholar, despite the fact that what you get will be more scientifically sound. Takes time to use. It’s not ideal for a last-minute “what do I do with this patient?” search when you’re on the spot. Mostly abstracts. A large number of PubMed’s results link only to abstracts. Some of these abstracts do link to full-text versions of articles when they happen to be listed on free/unrestricted websites. However, the majority of full-text articles do require additional access or log-in steps. So, you know that moment where you are standing there, panicked, holding that script in your hand? UpTo Date is your salvation in that moment. UpToDate is huge, comprising more than 11,000 topics in 25 specialties. But it’s not just a jumbled mess of research articles. It’s a massive user-friendly resource with tons of clinical guidelines—ones that are based on research—that you can use immediately in your clinical treatments. Plus, it’s physician-authored and evidence-based, so no pseudoscience nonsense here. With your membership, you can access the UpToDate website and find treatment recommendations, patient education information and handouts, and drug/pharmaceutical information—and it only takes moments to find what you need. In fact, lots of clinicians use UpToDate during point-of-care service, because many workplaces choose to embed UpToDate into their EMR/EHRs. I think the coolest part of UpToDate is that it has been proven over and over, in numerous research studies, that it helps clinicians deliver better care. Apparently, over 1.3 million clinicians in 187 (!!!) countries rely on UpToDate. And Nearly 90% of major academic settings use it as part of their care delivery models. For a general search of occupational therapy and dizziness, you will find about 140 results (I had to count these myself). Where UpToDate really shines is in overviews of different diagnoses and the best practices associated with treatment. These overviews are geared towards physicians, but as a therapist, it can be invaluable to see how your care fits in the overall treatment plan. Ask your institution for access to UpToDate. If you don’t work at an organization with access to this program, it’s worth requesting it. Yes, UpToDate is THAT GOOD. But it is pricey. The online base subscription for an individual is $519 per year! Plus, you’ll pay an additional fee of $6/month if you want to add the mobile app and/or add a second computer to your account, and there are other optional upgrades to increase your access level. You save a tad by purchasing two ($929) or three ($1229) years of access at a time, but your best bet will be to ask your organization to invest in one of the multi-user options. Search for specific diagnoses and feel confident incorporating new elements into your treatments. If you have a patient coming in with dizziness, you can quickly get an overview of symptom presentation, pathophysiology, and best practices for medical management of dizziness, as well as an overview of where your OT treatments fit in. You can also help physicians and other medical team members watch for symptoms that might be specific to dizziness. You can also access all sorts of patient education information in both English and Spanish, including “basics” and “beyond the basics.” In my opinion, this feature alone makes UpToDate pure gold. Take advantage of the patient education resources. We therapists know how important patients’ actions are to improve their own health. Don’t hold back on taking advantage of the many handouts and support documents provided in UpToDate. Use it for in-services and presentations. UpToDate contains tons of graphics, tables, and handouts for each diagnosis, which can be extremely helpful when you’re planning an in-service or other type of presentation. The cost. Unless your institution provides you with access, it’s fairly cost prohibitive. Overwhelming. It can feel a bit overwhelming when you first key in a term and see the sheer volume of content available at your fingertips. Each entry is also chock-full of citations and links, which can also make your head spin a bit. Obviously, this might be seen as a pro, but I couldn’t find any other cons, honestly! Ready to go into the research weeds? Need to access full-length text for a huge research review, in-service, or other presentation? If you need access to full-length articles, ProQuest is one of your best options as an OT. And the best part is that ProQuest access is free with your NBCOT membership. Yup, free. Many occupational therapists keep up their NBCOT membership for the “R” after “OT.” I maintain my NBCOT membership for ProQuest access, no joke. This is such an awesome tool, and I’m always surprised by how few NBCOT members realize that we have such an incredible resource at our fingertips! To access ProQuest, just log in to your NBCOT account and click on research tools. With 1,025 results coming in, you can see that ProQuest gives you one of the nicest balances of quality and quantity of the search options. 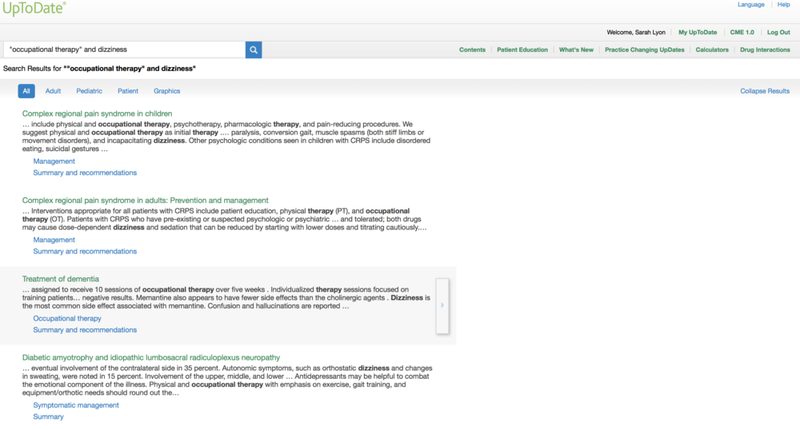 The inclusion of OT Practice in this search engine means that you will have nice overviews of many different practice areas. Use ProQuest when you need full-length OT (or PT)-specific research articles. If you’ve used other research engines, you’ll notice that it can be VERY challenging to find full-length articles in the physical and occupational therapy fields. You might be able to access some abstracts, but finding full-length articles isn’t always so easy. ProQuest is the ideal choice for when you know for a fact that you’ll need those full-length articles from the get-go. 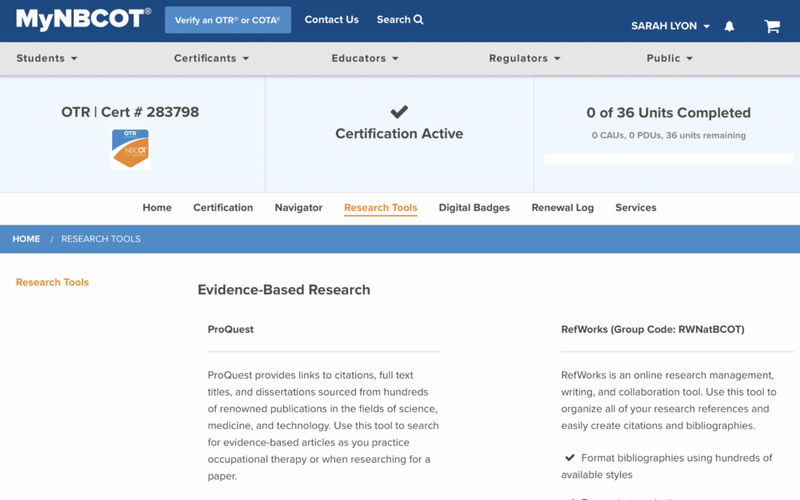 So many of are NBCOT certificants simply so we can have that “R” after “OT.” Take advantage of this wonderful perk and explore ProQuest when you need to really dive deep into research. Takes some time to use. A ProQuest search probably isn’t ideal for when you need a quick peek at a diagnosis as you’re standing there, petrified as your new patient walks in the door. Chances are you’ve heard of AJOT, the official publication of the American Occupational Therapy Association (AOTA). Its mission is to publish peer-reviewed research examining the effectiveness of occupational therapy interventions. AJOT publishes six print journals per year, and also publishes additional supplements online. All abstracts are available online. However, full content of AJOT is only available to subscribers, so if you want the whole she-bang, you must buy a subscription or be a member of AOTA. For a general search of occupational therapy and dizziness, you will find only 17 results, most of which do not contain applicable info to incorporate into your treatment plans. Obviously, the huge upside to AJOT usage is that all of the articles are OT-specific, and if you are an AOTA member, you have full access to them. Be sure to use it if you’re an AOTA member! You can access AJOT for free with your membership, which is $225/year for an OT and $131/year for an OTA. You can set alerts to notify you when a new issue is published, a specific topic has updated content, and more. Use it for research projects. 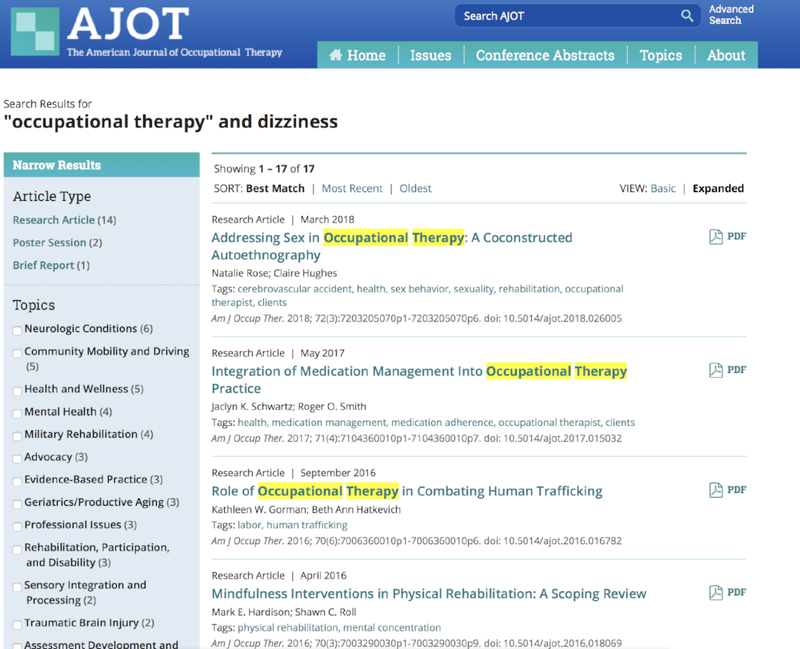 While you can find tons of info for a presentation, research review, or other academic-oriented project, AJOT is not great for information regarding specific symptoms or diagnoses that occupational therapists commonly treat. Too few results. If you look at our sample OT search about dizziness, you’ll note that it only turned up 17 results, and the top results are likely not related to the type of dizziness your patient may be experiencing. AJOT published an average of 98.8 over the past six years, approximately 81 of which were research studies. Cost for non-AOTA members. It’s costly to access AJOT as an individual. Individuals will pay $249/year in the U.S. (with other countries costing more). Conversely, institutions pay $299/year in the U.S. (with other countries costing more). The search feature isn’t as ideal as it should be. It’s important to note that there are no options for sorting/ordering the results displayed. This means you can’t sort your results by most-to-least recently published, so you might find yourself reading some 1980s-era research, depending on what you’re searching for. It is unclear how their order is determined, which can be frustrating. AJOT has a “low impact” compared to other professional journals. Because its content is exclusively OT-related, its scope and impact is limited, giving the journal an isolated feel. Articles do demonstrate the value of OT, but don’t often facilitate its use in the broader healthcare world. For comparison, AJOT has a five-year impact factor of 2.113, while the American Physical Therapy Association (APTA)’s journal is 3.619. That said, its impact factor has been steadily climbing over the past seven years! There are lots of options for finding research and research-backed treatment recommendations. The key is knowing which tool(s) to use for your specific needs. Here’s a breakdown to make life easier. At the end of the day, you’ll be best served by knowing which tool is best for which need, but you’ll likely wind up using some combination of research tools to get where you want to be. What questions do you have about finding the OT research that you need and integrating it into practice? These resources were also considered for this article and might be of use to you! If you think one of these should be featured in the future, let me know!